NOTE: I have published a review of this in Science Progress. It is in press. Figures illustrating this work are placed beneath this summary, followed by References to the original literature. 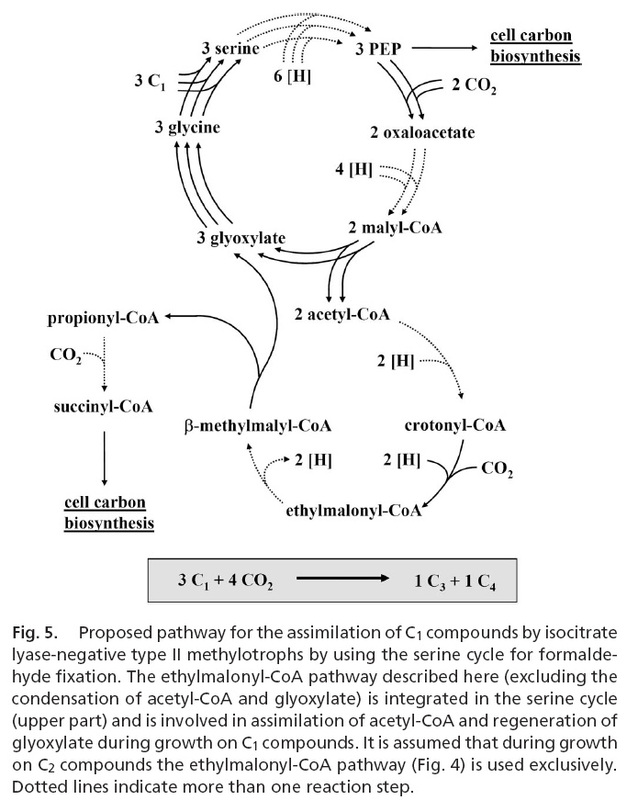 The Serine cycle was proposed by Quayle and colleagues [especially David Peel and Peter Large] as the route for methanol assimilation in the pink facultative methylotroph Methylobacterium extorquens [Refs 1-4]. An unsolved part of the pathway required acetyl-CoA to be oxidised to glyoxylate. In some bacteria this is achieved by the Glyoxylate cycle; this is the main route for bacterial assimilation of acetate or ethanol, first proposed by Hans Kornberg. The key enzyme for this pathway [isocitrate lyase] is absent from M. extorquens during growth on methanol or ethanol. Pat Dunstan [now Pat goodwin] in my lab showed that in this organism there is an alternative route for oxidation of acetyl-CoA to glyoxylate which operates during growth on both C1 and C2 compounds [Refs 5-7]. This was achieved by characterisation of mutants unable to grow on these compounds and by short-term C14 labelling experiments of the sort that were used to conclusively confirm the Calvin cycle, the glyoxylate cycle and the serine cycle. The key mutants that first showed that there is a route for oxidation of acetyl-coa to glyoxylate that is essential for growth on C1 and C2 compounds [eg mutant PCT48] were later shown to lack a novel acyl-CoA mutase [encoded by meaA; Refs 11,15 ]. 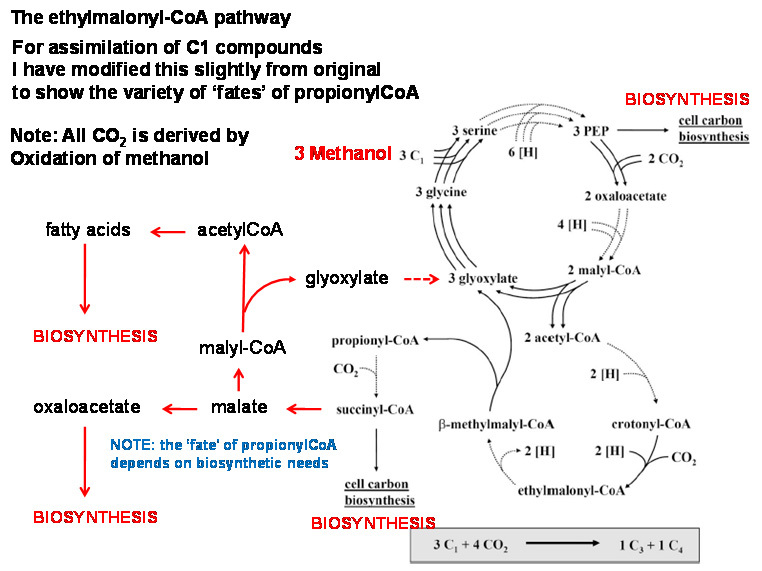 Refs 8-10 cover the work on assimilation of C3 compounds that also use this pathway; this is described in more detail on a separate page [click here] and it is also summarised in The Biochemistry of Methylotrophs]. 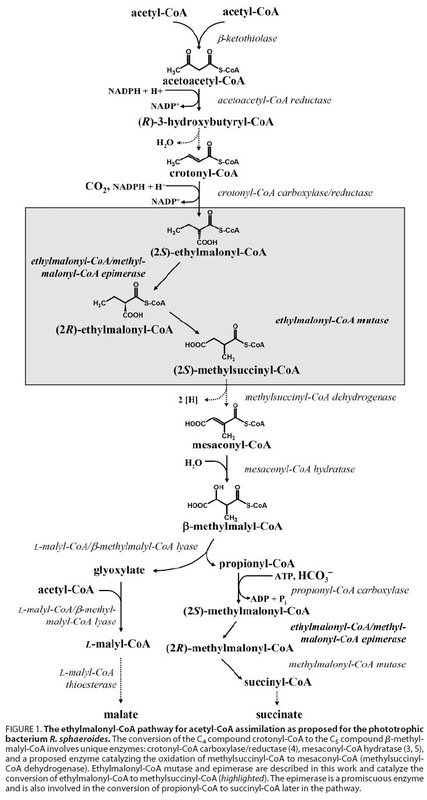 The nature of the pathway for regeneration of glyoxylate from acetyl-coA was eventually determined by Mary Lidstrom, Mila Chistersodova and their colleagues [Refs 12, 13]. Their Glyoxylate Regeneration Cycle [GRC] proposed a large number of intermediates [coenzyme A esters] and novel reactions. This 'long' pathway [in my opionion] did not fit our observations of rapid incorporation of label from radioactive acetate into glycine in methanol-grown cells, but clearly the basic principle of the pathway was likely to be correct. 1. Crotonyl-CoA carboxylase/reductase, catalyzing a reductive carboxylation of crotonyl-CoA to ethylmalonyl-CoA using NADPH. 2. Ethylmalonyl-CoA Mutase: a New coenzyme B12-dependent Acyl-CoA Mutase that catalyses the transformation of ethylmalonyl-CoA to methylsuccinyl-CoA. A third enzyme essential for the conversion of crotonyl-coA to methylsuccinyl-CoA is a non-specific epimerase, converting (2S)-ethylmalonyl-coA to (2R)-ethylmalonyl-coA, the substrate for the mutase. These enzymes also operate during growth of M. extorquens on methanol [Ref 14], and the pathway has been further confirmed by Julia Vorholts group in Zurich in a remarkable series of C13 labelling experiments where kinetic isotopomer profiles collected by Liquid chromatography-high resolution mass spectrometry during short term incubation experiments were combined with steady-state isotopomer distributions measured by NMR [Ref 16]. The Serine cycle Taken from the Biochemistry of Methylotrophs. Summary of proposals of Dunstan & Anthony showing a shared pathway for C1 and C2 assimilation [Refs 5-8]. The mutants of the PCT48 type [meaA; Ref 11] were later shown to lack a novel mutase, subsequently identified as ethylmalonylCoA mutase [Ref 15]. [Refs 12, 13]. I have modified this slightly for clarity. 1. Large, P.J., Peel, D. and Quayle, J.R. Biochemical Journal 81 , 470-480 (1961). Microbial growth on C1 compounds: Synthesis of cell constituents by methanol- and formate-grown Pseudomonas AM1 and methanol-grown Hyphomicrobium vulgare. 2. Large, P.J., Peel, D. and Quayle, J.R. Biochemical Journal 82, 483-488 (1962). Microbial growth on C1 compounds: Distribution of radioactivity in metabolites of methanol-grown Pseudomonas AM1 after incubation with [14C]methanol and [14C]bicarbonate. 3. Large, P.J., Peel, D. and Quayle, J.R. Biochemical Journal 85, 243-250 (1962). Microbial growth on C1 compounds: Carboxylation of phosphoenolpyruvate in methanol-grown Pseudomonas AM1. 4. Large, P.J. and Quayle, J.R. Biochemical Journal 87, 386-396 (1963). Microbial growth on C1 compounds: Enzyme activities in extracts of Pseudomonas AM1. 5. Dunstan, P.M., Anthony, C. and Drabble, W.T. (1972). The involvement of glycollate in the metabolism of ethanol and of acetate by Pseudomonas AM1. Biochemical Journal 128, 99-106. 6. Dunstan, P.M., Anthony, C. and Drabble, W.T. (1972). The role of glyoxylate, glycollate and acetate in the growth of Pseudomonas AM1 on ethanol and C-1 compounds. Journal of General Microbiology 128, 107-115. 7. Dunstan, P.M. and Anthony, C. (1973). The role of acetate during growth of Pseudomonas AM1 C1 compounds, ethanol and 3-hydroxybutyrate. Biochemical Journal 132797-801. 8. Taylor, I.J. and Anthony, C. (1976). Acetyl-CoA production and utilization during growth of the facultative methylotroph, Pseudomonas AM1, on ethanol, malonate and 3-hydroxybutyrate. Journal of General Microbiology 95, 134-143. 9. Bolbot, J.A. and Anthony, C. (1980). The metabolism of pyruvate by the facultative methylotroph, Pseudomonas AM1. Journal of General Microbiology 120, 233-244. 10. Bolbot, J.A. and Anthony, C. (1980). The metabolism of 1,2-propanediol by the facultative methylotroph, Pseudomonas AM1. Journal of General Microbiology 120, 245-254.
assimilation of methanol and ethanol by Methylobacterium extorquens AM1.